How lovely to be this close to nature! Yes, a very important connection, to be sure. 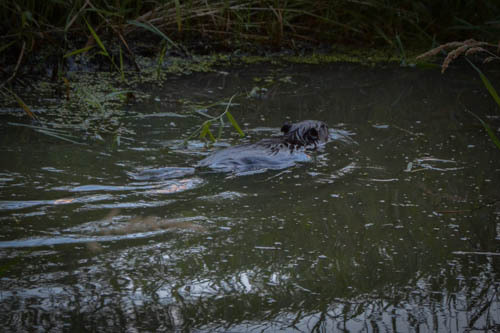 Wow Jane, beavers are so elusive–great get. I’ve seen an otter in the lagoon by my house exactly ONE time in 13 years so I know how tough it is to get these little critters in your lens! Well done. I checked my front yard. No beaver, but two kinds of beebalm (didyma and fistulosa). At least that’s something. Admittedly, we do have a rather unusual front yard…an acre and a quarter of wetland…part of a corridor of wetlands that run through our little suburban city. Last night we could hear migrating Canada geese flying low over. I’m always amazed how they follow the water and fly at night. Beebalm? I need to pull out guide to see what your plants look like. The genus is Monarda. Monarda didyma are very popular garden perennials — hummingbirds love ’em — while the shorter, lavender-coloured M fistulosa are less well known. I think I originally grew mine from seed. Anyway, they’re both North American natives, the didyma’s range being a little more restricted to the eastern side of the continent. Dandyknife- Those native plants are beautiful! I must check with our local native plant specialist to inquire about similar natives for our area. I bet they also attract bumblebees… which would really delight me! Nice catch of a shy critter! It has been absolutely wonderful watching your adventures over the weeks. I need to catch up reading about the walk. The photos are very inspiring. That’s good news… no nutria? Interesting how muskrats are seemingly part of the ecosystem, and then disappear for a while. I wonder how large their range is. Great that you have an absence of nutria! Hope it stays that way.